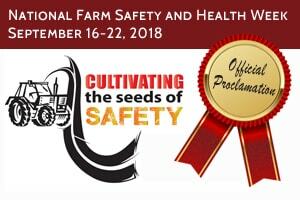 President Trump, Minnesota Governor Mark Dayton, and Wisconsin Governor Scott Walker have proclaimed the week of September 16 – 22, 2018 as National Farm Safety and Health Week. These statements from our elected leaders recognize the important role farmers play in our overall economic strength by producing quality food for our country and the world. Click the links below to learn more about National Farm Safety and Health Week and the state and federal commitment to this initiative.